Here are the “Best Hikes in Chile” at the Lake and Volcano District. If you are an avid hiker, nature lover or fellow traveler looking for some amazing landscapes, these are the places you’d definitely want to go! The Christmas Crater – or Crater Navidad in Spanish – is a pyroclastic cone of the Lonquimay Volcano located in the Malalcahuello National Reserve in Chile’s Lake and Volcano District. It was formed during the volcanic eruption on December 25 of 1988, and reaches a height of 190 meters from its base. The hike to the crater is not technical; but you’ll do require mountain gear if you want to climb it in winter because it is covered in snow. However, in summer (from November to Early April), the trekking doesn’t require any gear. The hike is relatively short, and takes approx. 2 to 4 hours back and forth depending on your walking pace. It is ideal for families with young children, or people with not a lot of hiking experience. From the top, you’ll get to enjoy a panoramic view over the foothills of the Lonquimay Volcano, its lava field, the extended araucarias tree forests of the Malalcahuello Reserve, along with view over the Tolhuaca and the Callaqui Volcanoes. The Coloradito trail, located at the Malalcahuello National Reserve, is a place shaped by tectonic and volcanic processes that offers an interesting fauna and flora characterized by its variety. This trail is a good alternative if you want to see the typical landscapes of the Andes mountain range under the watchful eye of the Lonquimay Volcano. All along the way, you’ll pass through forests of endemic trees such as the araucaria and the lenga tree surrounded by the ground vegetation with a predominance of michay, quila and viola trees. This trail described starts in a sector called “El Colorado”, unique access to the Lonquimay Volcano that ends to a path near the Coloradito River. The landscape is dominated by the presence of the Lonquimay Volcano and the Sierra del Colorado. At some parts of the trail, you’ll be able to see the Llaima Volcano and the Sierra Nevada. This 10-kilometer long hike is recommended for active people. The Conguillio National Park is one of the most outstandings places Chile has to offer for the nature lovers. With the stunning Llaima Volcano, Sierra Nevada, lagoons everywhere, araucarias tree forests, endemic fauna and flora, it is a must-see for everyone who wants to visit Southern Chile. The national park has a wide variety of trails, but without a doubt, the Sierra Nevada hike is the most accessible and does offers a wider range of landscape, enough to get a good idea of the natural richness existing in the region. The Sierra Nevada trail begins from one of the most beautiful beaches of the Conguillio Lake, passes through a spectacular endemic forest with several viewpoints facing the lake along the way. After 3 hours, the trail reaches a clear and an out-of-the woods viewpoint facing the Llaima Volcano and the Conguillío Lake. The hike is not technical, but does require a minimum of good health since the path can sometimes be steep. In winter, the trail is covered in snow, requiring mountain gear and good hiking experience. Conguillío National Park – Chile. 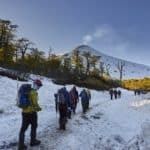 Close to the Argentinean Border, and located at the foothills of the Lanín Volcano, this trail called “Lagos Andinos” is a must-see of the Villarrica National Park. During this amazing hike, suited for families, you’ll visit 3 lagoons in a large endemic forest with Coihues and Araucarias trees and end up in a volcanic landscape dominated by the majestic Lanín Volcano. The hike begins at the shores of the Quillelhue Lagoon at 1200 meters above sea level. After 40 minutes of hiking on a flat terrain, you’ll arrive at the Huinfiuca Lagoon, the perfect spot for picnic. While you visit the park you will witness how the Lanin volcano has permanently shaped the landscape of the area with its eruptions and you’ll have the fantastic opportunity to see and walk on the lava flows that once came from the heart of the earth. You’ll also visit the pristine lakes Quillelhue, Escondido (Hidden) and Huinfiuca with its clear waters that reflect stunning colors. This hike is not technical and only requires a minimum of good health. The Huerquehue National Park is located at the foothills of the Andes, 35 km (22 miles) from Pucón. The park covers 12.500 hectares (30.890 acres) with various lagoons, dense vegetation and gigantic trees that are the habitat of several endemic birds. The hike, called “Sendero Los Lagos” starts easy but after a short distance the trail becomes rougher and sometimes steeper, but is still considered a relatively easy hiking level. On your way to the lakes, you’ll get to see the Nido de Aguilas (nest of eagles) waterfall before the terrain gets steeper, surrounded by gigantic coigües (Nothofagus dombeyi) and mañíos (Podocarpus nubigena). The first lookout point is where you’ll get to appreciate the views of Villarrica Volcano (2.847 m / 9.349 feet) and Tinquilco Lake which are absolutely stunning; here you’ll find great photo opportunities as well as chance to reenergize with a snack. If you’re lucky, you can spot some birds that live in the forests of Nothofagus, such as chucao tapaculo (Selorchilis rubecula), black-throated huet-huet (Pteroptochos tarnii) and the magellan woodpecker (Campephilus magellanicus) among others. Once you pass the Trufulco falls, the hike gets a little more demanding. Once you’re over 1000 meters above sea level, you’ll see the first araucarias trees. You’ll then walk through a mixed forest before arriving at the first lake called Lago Chico. It is characterized by its clear waters reflecting the image of hundreds of araucarias, and the snow-capped peaks around. After visiting the different lakes, you can then start to turn around and walk back to the entrance of the park. El Cañi Reserve is located approximately 21 kilometers from Pucón. This 500-acre private reserve committed to the preservation of the Araucaria Araucania tree species. This hike, although not technical, does require an overall good physical condition since you’d be constantly walking on a steep terrain until arrival to the final viewpoint. It starts with approx. 1,5 kilometer of flat terrain, and from there you’ll start the stiff climb for 3 more kilometers. You’ll then arrive at Aserradero Refuge (1000 meters above sea level). It is the entrance of the reserve, with the first panoramic views over the valley and flora. You’ll pass through the Las Totoras Lagoon, Negra Lagoon surrounded by the thousands-year-old Araucaria, Lengua and Coihue trees. The final path climbs until you arrive at the final viewpoint, your reward. You’ll have a 360° panoramic view over 4 volcanoes, two lakes and the valleys around the Reserve. Moreover, you can walk around a small path that starts at Laguna negra and takes you to 6 mores lagoons. Without a doubt, the Villarrica Volcano (2800 meters) ascent is a must-do activities if you plan to visit Pucón. As of today, it is one of the most active volcanoes in South America. The climb to its open crater is definitely a one of a lifetime experience. The adventure starts at approx. 6 am, when the van takes you to the ski center located at 1.300 meters. After putting on your mountain gear, the hike begins with 2 options: use the chairlift, or start walking immediately. Depending on your walking pace, it will take you approx. 4-5 hours to reach the open crater. From there, you’ll get to have an incredible 360° panoramic view over volcanoes, lakes, mountains and valleys around. The descent consists in sliding down until the base of the Volcano (approx. 2 hours) where the van awaits you before taking you back to Pucón for a well-deserved rest. The hike to Pichillancahue is not very famous but will surely take your breath away for its landscape. This is a hike suitable for everyone who seeks connection with nature, from children to elder adults. This Glacier is located at the Villarrica National Park, Coñaripe side. Youll get to see several majestic snow-capped volcanoes such as Quetrupillan and Rucapillan. The vegetation changes from raulí and hualle forests to araucarias as you ascend to Chinay. The highest point of the day at 1.250 meters / 4.101 feet altitude. After approximately 1.5 hour of hiking, you’ll arrive at the Pichillancahue Glacier trail. A good spot to relax and eat a good snack to refill energy if needed. The rest of the trail (3.5 hours round trip) leads to a phenomenal glacier covered by black volcanic ashes. Once again, you’ll be able to enjoy the stunning views of four volcanoes. You’ll have to go back to the main road and hike down through the forest. This hike is not technical and does not require any mountain gear. The best hiking time is during summer season.